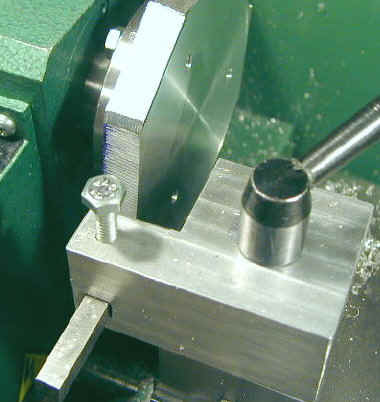 This operation is perhaps the most critical of all since the accuracy with which the recess mates with the raised land on the spindle plate will determine the runout of the back plate which, in turn, will contribute to the total runout of the chuck when mounted. You will need the spindle template described previously to complete this operation so if you have not already made one, this would be a good time to do so, before you start this procedure. 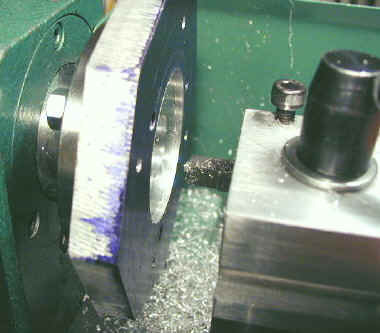 Take a light boring cut from the center hole out towards the outside edge of the plate. 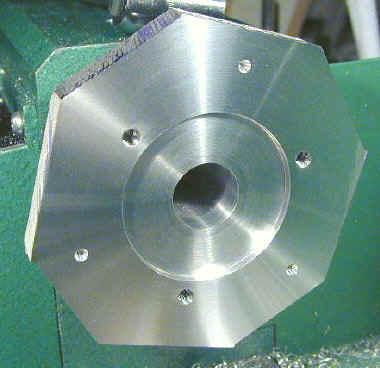 You want this cut to serve as a guideline for boring the recess, so stop at a diameter of about 2.100". The remaining .065" will be removed very carefully after we get the recess bored out to a depth of about 1/8" (.125). Instead of a boring tool you could use a ground HSS tool mounted in the back side of the toolpost. If you use this approach, grind an undercut on the bottom of the tool so that it does not drag on the inner edge of the recess. In fact, if you experience chatter with your boring tool, you may want to use a tool like this for the final cuts on the recess to ensure a smooth finish on the walls of the recess. Take successive boring cuts of about .020 per pass until the recess is about .130" deep. Make the last cuts very light at about 1500 RPM to get a nice finished surface for the bottom face of the recess. Now we are ready to bring the recess to its final diameter. This is a critical step and must be done very precisely without overshooting, so take your time, take small cuts and measure frequently. When I'm working to a critical dimension like this I like to write the target dimension and each successive measurement in my shop workbook. This discipline helps to ensure that I don't get impatient and remove too much metal. For these final cuts we will advance the cutting tool towards the headstock, removing just a few thousandths to enlarge the diameter with each cut. Of course, since we are enlarging an inner diameter, the cross feed must be cranked outwards away from the lathe center on each successive cut. Be sure to remove any backlash between cuts and remember that each cut removes twice as much metal as the number of divisions on the dial. For example, if you move the cross feed out by .002" on the dial, the diameter of the recess will be increased by about .004". Also keep in mind that the divisions on the dial are not exactly .001". As you approach to within about .010 of the final diameter of 2.165", move the cross slide out a division or less at a time. Stop after each cut and measure carefully using the sharp points of the dial caliper and swinging them in an arc to make sure you are traversing the widest point of the recess. 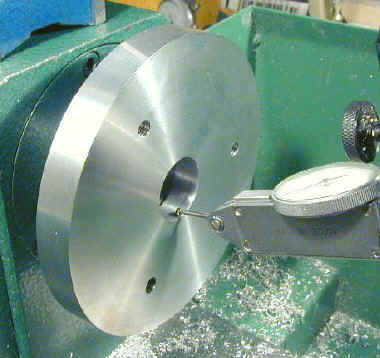 After each measurement, try to press fit the spindle template land into the recess. When it just fits snugly, you are done with this operation. Turn your cutting tool to about a 45 degree angle and take a very light chamfering cut to clean up the sharp outer edge of the center hole. Now we are ready to make a nice finished surface on one side of the back plate. One problem you will encounter here is getting the cutting tool to reach all the way to the edge of the plate. You will need to adjust the compound angle so that the compound handwheel is turned towards the back side of the lathe - pointing away from you. With some fiddling with the toolpost angle you should be able to get the tool far enough out to reach the corner of the plate, or at least past the sides, which is good enough. Face off only enough of the surface to get a nice smooth finish - remember, we don't have a lot of extra thickness to work with. 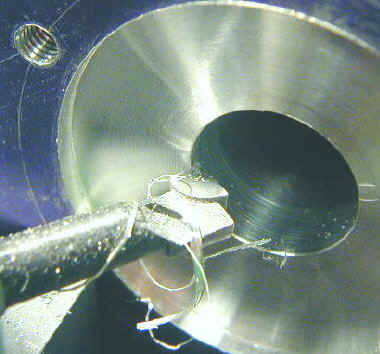 Use the boring tool to lightly champfer the sharp edge of the recess. Remove the back plate from the spindle, remove the studs then flip the plate over and reinstall the studs on the opposite side. 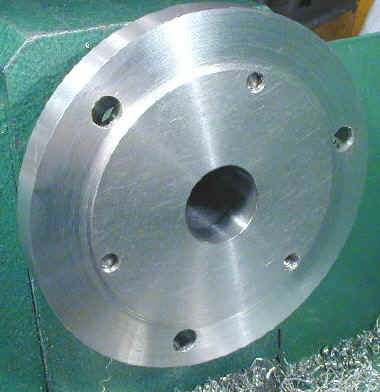 Mount the plate to the spindle seating the newly machined recess. Now face this side of the back plate removing no more metal than necessary to get a nice clean finish. Mount the plate back on the spindle and set up to turn the rough edges into a circle. 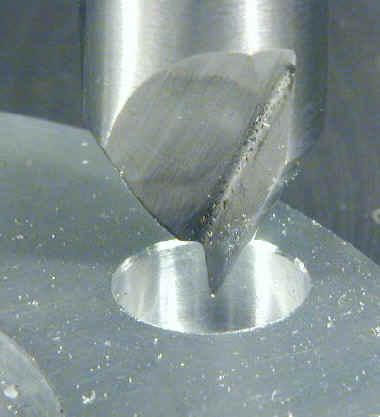 A problem you will run into at this point is getting the cutting tool far enough out to turn the edge. One option is to use a right hand cutting tool. I use a special offset tool holder that I made for this purpose. A simpler version that I made before I had my mill is also shown. When you're all done turning the outside edge this is a good point at which to test the runout of the plate. If all has gone well you would like to see a runout of 0.001" or less. Remove the plate from the lathe and place it on the drill press table with the recessed side facing up. Drill out the holes for the chuck bolts, that were previously center drilled, to 5/16" and finally to 21/64". 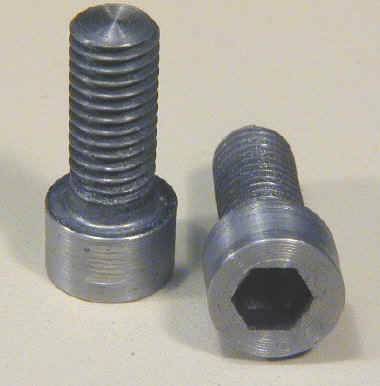 The heads of the chuck mounting bolts must be recessed into the back of the plate. 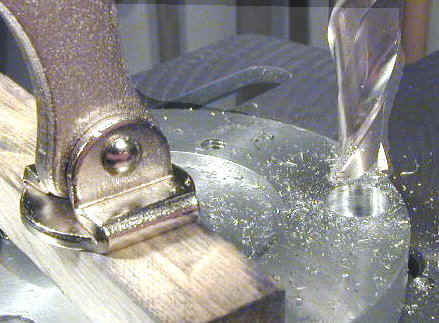 The objective is to drill down so that the outside edge of the drill goes just a little deeper than the height of the bolt head. 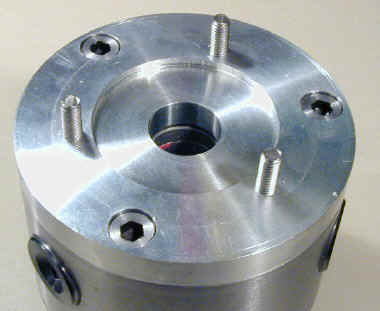 To get the bolt heads to fit these holes, I turn them down a little bit to a diameter of .465 and and height of .285. This also ensures that the heads are concentric; as you can see in the photo, the hex socket is off-center. On my 3-jaw chuck, one of the bolt holes was not very deep so I turned about .050 off the end of the bolt so that it would seat properly. These next drilling operations must be approached carefully since we are only drilling part way through the plate. If your forget this, and drill all the way through, you will not be pleased with yourself. 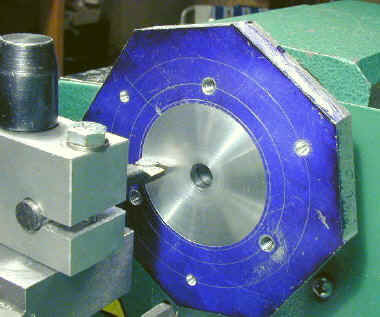 Most drill presses have a depth-stop feature that you can set to limit the depth of the hole being drilled. I used a piece of scrap about .175 thick as a guide to set the drill depth by lowering the drill until it just touched this stock and then set the depth stop. Drill each of the chuck bolt holes out using a series of drills up to 1/2". I used increments of 1/32" for each drilling pass. 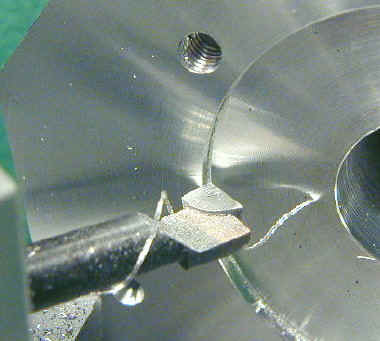 The final step is to use a 1/2" 2-flute end mill to flatten out the conical base of the bolt holes left by the drill. If you have one, of course, you should use a 1/2" counterbore for this operation; but they are an expensive investment if you use them infrequently. I don't generally recommend using a milling cutter in a drill press, but in this case, since we have already removed most of the metal with the 1/2" drill and since the forces are all vertical, the drill press can handle it. 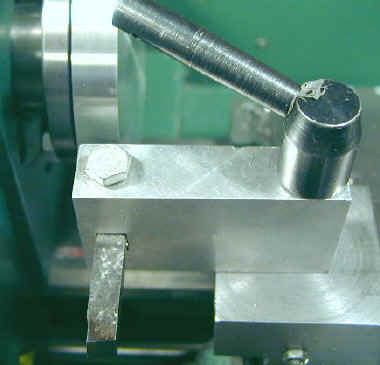 The plate should be securely clamped to the drill press table for this operation, but before you clamp it down you must ensure that the hole is aligned with the drill spindle. You can make yourself a little alignment tool by turning a cone about 1/2" long on the end of a piece of 3/8" drill rod. You could also use aluminum or brass as long as the cone is accurately concentric with the outside diameter of the stock. 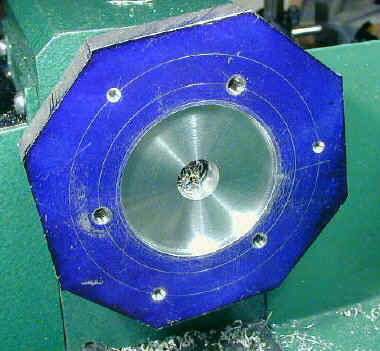 Insert the alignment tool in the drill press chuck, then lower the spindle until the cone lines up in the bolt hole. Then lock the spindle to hold the plate in place and clamp the plate to the drill press table. 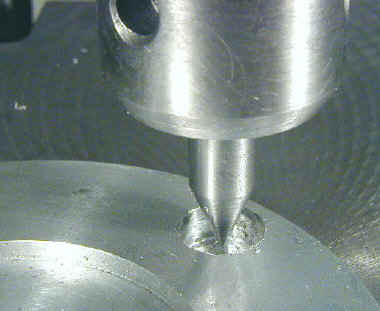 Mill out the cone-shaped depression left by the 1/2" drill until you have a flat surface for the bolt head to bear on. If you have a large enough countersink, use it to put a nice finished edge on the bolt holes. Now we're ready to turn down the outside edge, leaving a raised area to mate with the recess in the back of the chuck. Here again we want to get the diameter as close as we can to the desired dimension of 2.834 as specified in the chuck documentation. Take a very light initial facing cut starting out the outside edge of the plate and stopping about 1/8" outside the stud holes. This will be our reference point so that we don't overshoot. Continue facing this same region until you have removed about .100". Next we will take a little metal at a time off of the outside diameter of the raised land until we bring it down to exactly 2.834" in diameter. 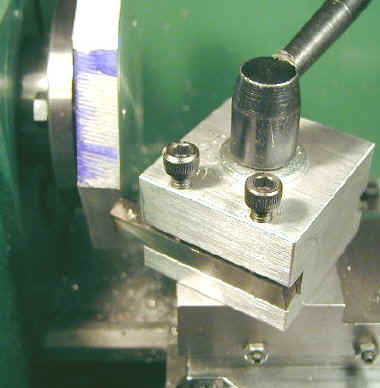 As you approach the target diameter, advance the cross feed one division or less on each pass, stopping frequently to measure and test fit to the back of the chuck. When the chuck just press fits over the raised land you are done. 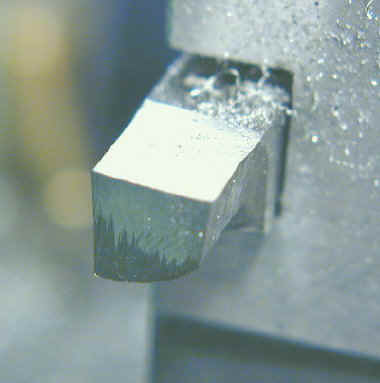 Use a file or lathe bit to lightly champfer the sharp edge. Insert the mounting bolts into the counterboreed holes and tighten them down. Make sure that the heads of the bolts are entirely below the back surface of the adaptor plate so that they will not interfere with the mounting of the plate on the spindle. Screw the studs into the threaded holes and mount the chuck on the lathe. Now comes the moment of truth. 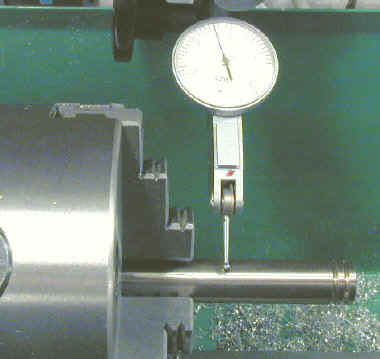 Chuck a piece of drill rod or other accurately ground stock into the chuck and measure the runout close to the chuck using a dial test indicator. Hopefully, you will see less than .001" runout, but .002-.003 is not too bad. Anything more than that is undesirable if you intend to use the chuck for any kind of precision work.